View from the sidewalk looking North towards Fiddler's Hearth pub. 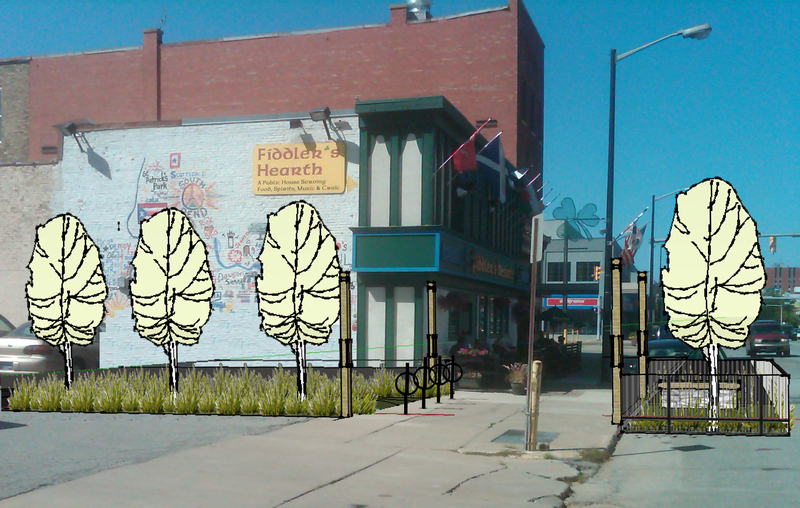 I’m excited to announce that South Bend will be participating in this year’s international Park(ing) Day. It is an event that centers around converting parking lot space to green space for the day. Who knew raising awareness for green space could be so fun! We’ll be outside Fiddler’s Hearth, Friday September 17th, enjoying the pocket park from 9am – 3pm, with construction starting around 8:00am. KSBB would love for you to participate at any level, either helping with the quick construction/tear down or just enjoying the green space provided. Please contact us at KSBBinfo@gmail.com for more information on how you can participate in Park(ing) Day 2010. Cheers! This entry was posted in Uncategorized and tagged Fiddler's Hearth, Foegley Landscape, keep south bend beautiful, KSBB, Park(ing) Day 2010, South Bend. Bookmark the permalink.